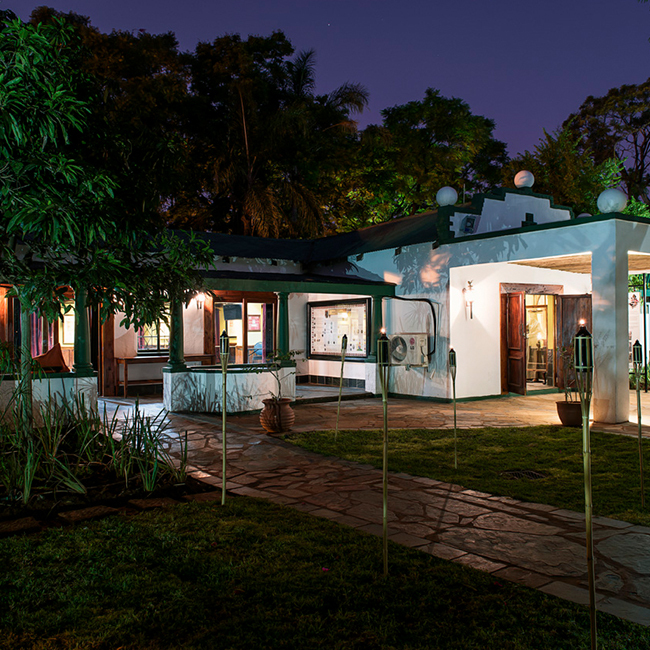 Kedar Heritage Lodge, Conference Centre & Spa (Kedar) is a heritage lodge themed after one of South Africa’s most noteworthy historical events, the South African War (1899 – 1902). 'South African War (a.k.a. the Anglo-Boer War) remains the most terrible and destructive modern armed conflict in South Africa’s history. It was an event that in many ways shaped the history of 20th Century South Africa. The end of the war marked the end of the long process of British conquest of South African societies, both Black and White'. - Gilliomee and Mbenga (2007). Stephanus Johannes Paulus "Paul" Kruger (10 October 1825 – 14 July 1904) was one of the dominant political and military figures in South Africa, and President of the South African Republic (or Transvaal) from 1883 to 1900. Nicknamed Oom Paul ("Uncle Paul"), he came to international prominence as the face of the Boer cause. He has been called a personification of Afrikanerdom, and remains a controversial and divisive figure; admirers venerate him as a tragic folk hero, and critics view him as the obstinate guardian of an unjust cause. 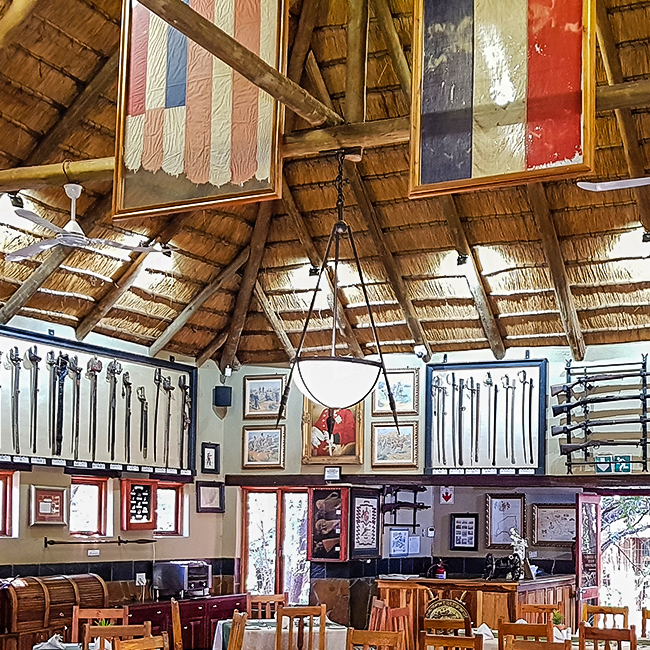 Kedar is built on Paul Kruger’s erstwhile farm, Boekenhoutfontein, thus making it a perfect setting to highlight this pivotal historical event, the South African War. The farm lies nestled in a valley surrounded by hills covered with lush bushveld. It boasts one of the few peat wetlands in the North-west province and can be regarded as an historical jewel in the area, as it is also the site of many important archeological findings from different eras. 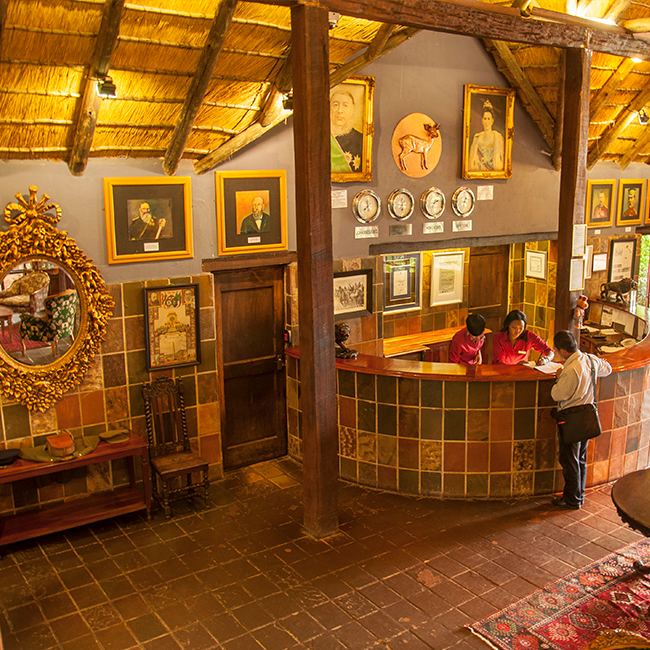 Situated on this 700 hectare game conservancy is the Paul Kruger Country House museum (a National Monument). 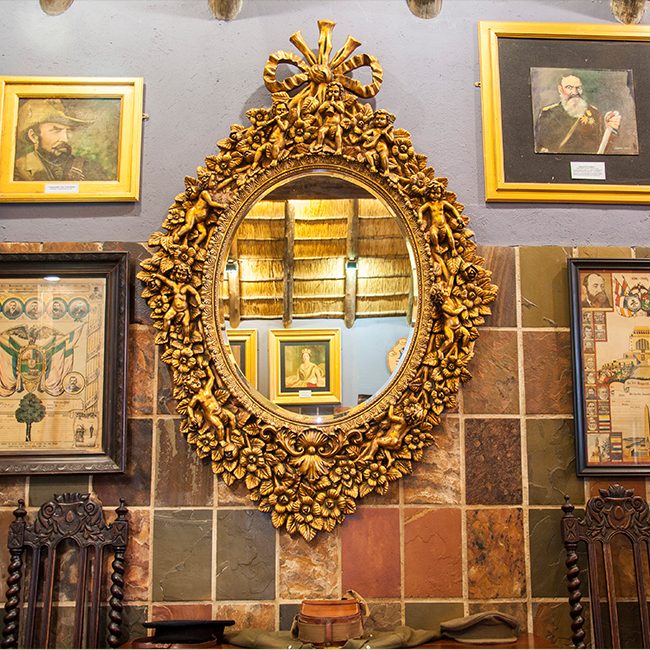 In keeping with the theme, Kedar has a plethora of authentic South African War memorabilia readily displayed in and around the property. This collection is one of the largest and most diverse private South African War collections in the world and boasts everything from medals, badges and uniforms to weapons, field guns (cannons) and swords, along with many other fascinating artefacts. What makes Kedar even more unique is how visitors get to interact with this vast collection of memorabilia. 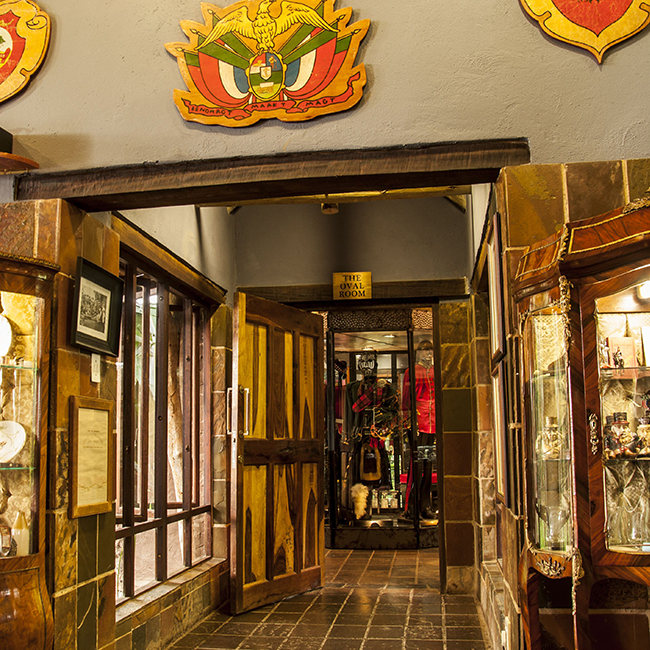 Many collections of South African War memorabilia are either not open to the public or are displayed in museum settings. Not at Kedar. 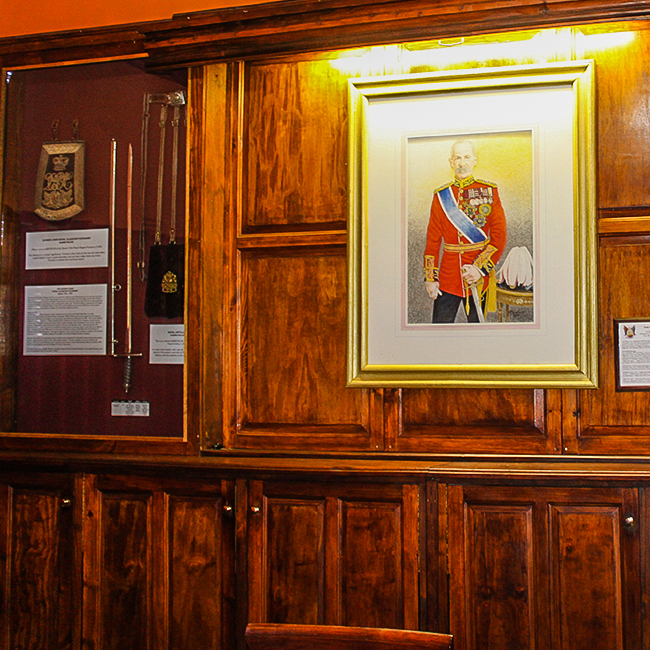 At Kedar, the memorabilia is readily displayed in and around the lodge. This allows the visitor to interact with the memorabilia in a more leisurely manner, for example, while having a meal or a drink. Many of the pieces on display at Kedar reflect fascinating stories from the war. Some tell the story of the artefact until it ended up at Kedar. All the memorabilia is clearly marked and this collection is continually being updated (almost on a weekly basis). For those who have a passion for history, it will literally take days to get through all Kedar has to offer. 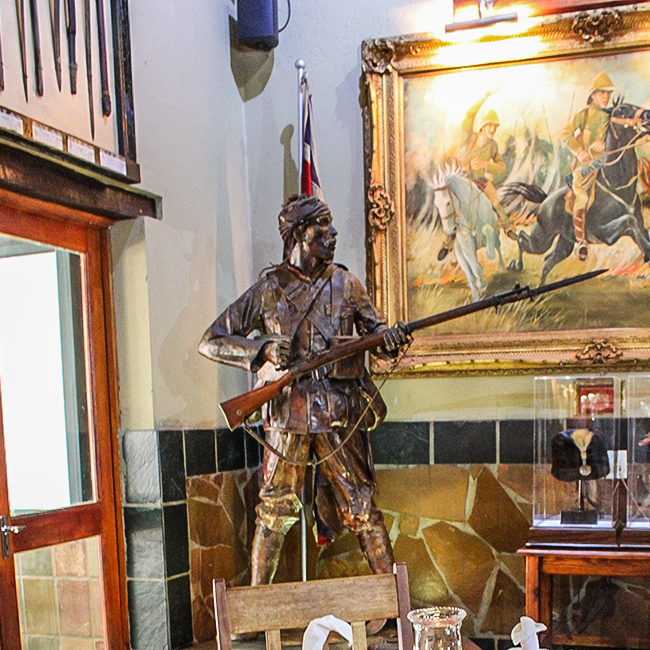 As one walks into the reception at Kedar, you are immediately exposed to the theme of the South African War which follows throughout the establishment. The reception has many artworks on display on the walls, as well as unique authentic memorabilia showcased in cabinets. One piece that stands out due to its historical relevance is the Lord Lieutenant uniform belonging to Henry Morris Upcher. Although a beautiful uniform in its own right, it is also special because the bird, the Upcher Warbler, is named after him! This is a room themed after Lord Roberts. Field Marshal Frederick Sleigh Roberts, 1st Earl Roberts (30 Sep 1832 – 14 Nov 1914) was a British soldier who fought in the South African War and was one of the most successful commanders of the 19th century. The entrance to the Lord Roberts boardroom is a mirrored space which houses a wonderful ceramic collection and an extremely rare bronze bust of Paul Kruger by German artist Ernst Wenck. 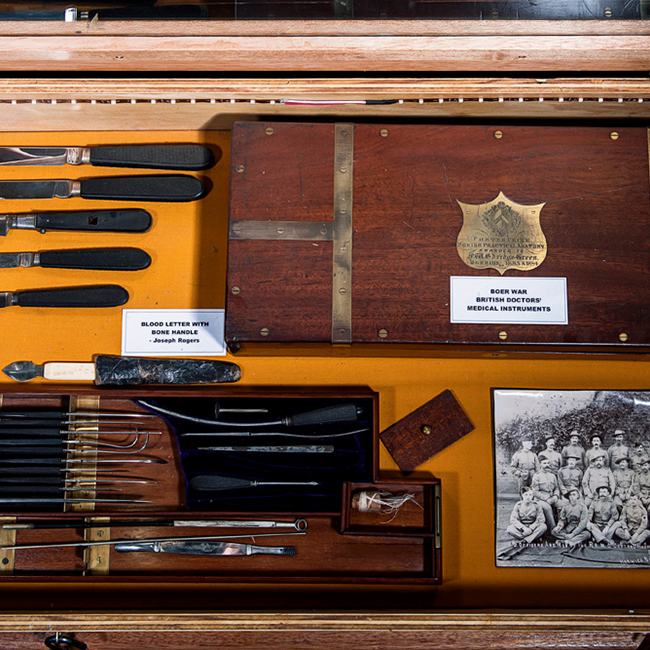 The Lord Roberts boardroom is split into two sections, the smaller housing Lord Methuen’s personal silver hip flask and map, among other pieces of militaria, such as Victorian helmet plates and a Boer War period frock coat. 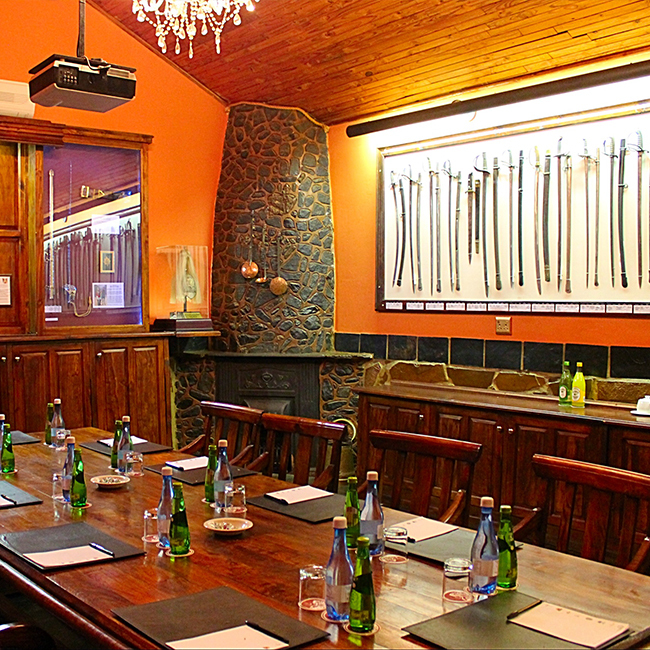 The larger of the two rooms houses an array of Victorian period swords used by the British and various other nations who took part in the South African War. One piece which stands out is The Queens Own Glasgow Yeomanry sabretache (a beautifully bullion-embroidered cavalry officer’s pouch) and the only one known to our museum curator. An old house built by Paul Kruger for one of his children has been converted into a conference room. 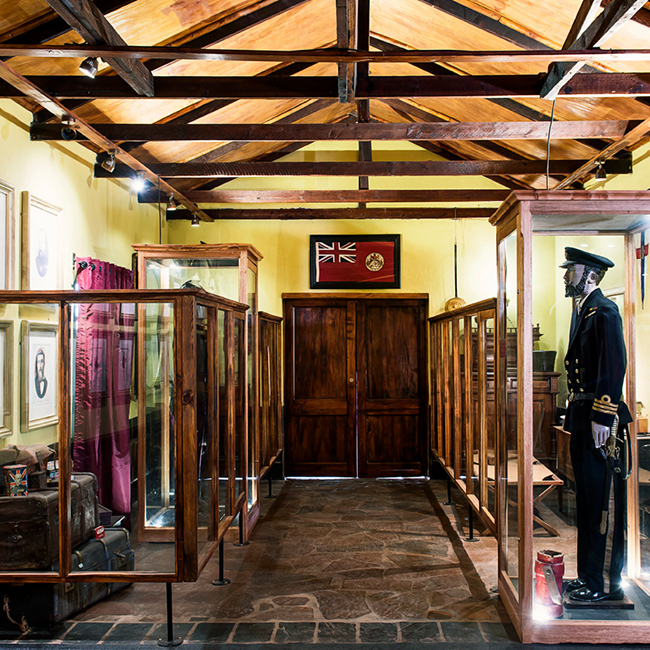 It houses a large collection of ephemera (documentation) from the Anglo Boer War – pictures of soldiers and generals, Victorian women’s clothing, a sailor’s uniform and furniture from the period. Also featured is detailed research on aristocrats who took part in the conflict, on both sides, as well as foreigners who fought for the Boers. a unique South African War Commandant’s sword belonging to J.P.Roux. The Oval room also houses a near-complete ZAR and OFS badge collection, many of which are very rare. 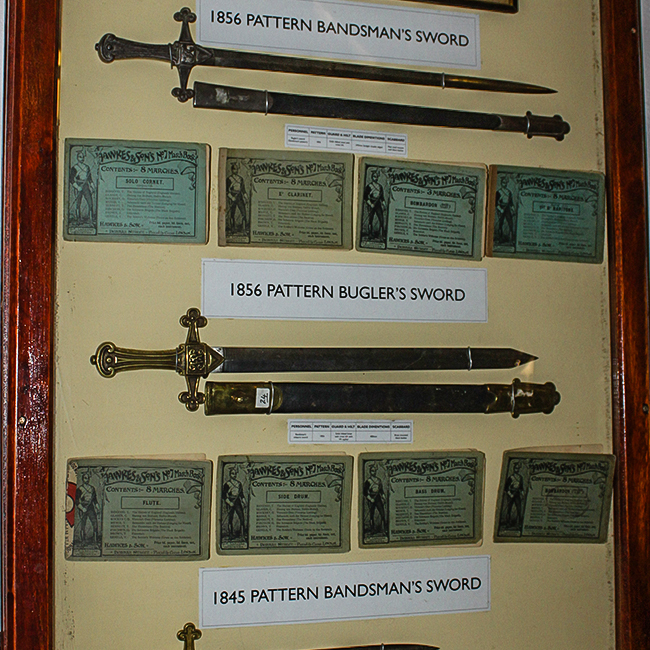 On the front wall there is a collection of Victorian bandsman, bugler and drummer swords. 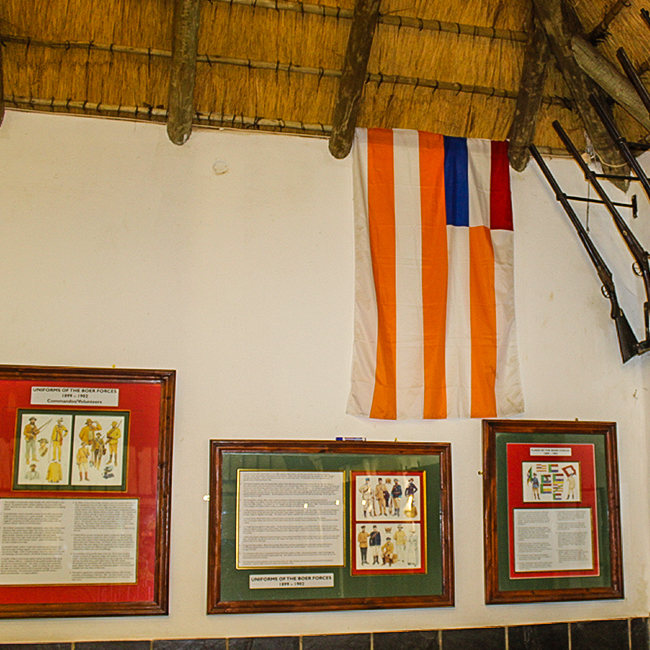 The rest of the surrounding walls have pictures of Boer generals flanked by period rifles and longarms. An interesting fact about the pictures of the generals is that they were initially displayed at a leading South African university for many years. At some point however, the pictures became controversial and were torn down. One of the students who witnessed this was granted permission to salvage the remains and keep them, which he did until one day he visited Kedar. He then realised that this would be an excellent home for these portraits as Kedar is passionate about the preservation of South African history and heritage. After repairing the portraits and conducting the necessary research on each and every general, Kedar placed the portraits on display in the Boekenhoutfontein conference room. This is one of the main dining venues where breakfast, lunch and dinner are usually served and where many memorable gala dinners have been hosted. Guests are welcomed at the entrance by a gun (cannon on display). As one enters, there is a display about Indian stretcher bearers, featuring an authentic stretcher from the period. An interesting fact is that Mahatma Gandhi was one of these stretcher bearers during the South African War. The surrounding walls are lined with period rifles and longarms. There is also a life size metal sculpture of a Gentleman in Khaki. "The Absent-Minded Beggar" is an 1899 poem by Rudyard Kipling, set to music by Sir Arthur Sullivan and often accompanied by an illustration of a wounded but defiant British soldier, "A Gentleman in Khaki", by Richard Caton Woodville. The song was written as part of an appeal by the Daily Mail to raise money for soldiers fighting in the South African War and their families. The fund was the first such charitable effort for a war.